To Cite: Shahbazian H, Latifi S M, Nouhjah S. Cut-Off Point of Waist Circumference Used for the Diagnosis of Metabolic Syndrome Among Adult Population in Ahvaz, Southwestern Iran, Jentashapir J Health Res. 2015 ; 6(4):e30588. doi: 10.17795/jjhr-30588. Background: Metabolic syndrome (MetS) is a well-known risk factor for type 2 diabetes and cardiovascular disease. Waist circumference (WC) is an essential component for the diagnosis of the MetS. Objectives: The aim of this study was to compare the cut-off points of WC proposed by the international diabetes federation (IDF), adult treatment panel (ATP III), and iranian national committee of obesity (INCO) with that of the present study for predicting the MetS. Patients and Methods: This cross-sectional study was performed on 930 individuals (439 males and 491 females) aged more than 20 years living in Ahvaz City, capital of Khuzestan Province in southwestern Iran during 2009 - 2010. Waist circumference cut-off values were obtained using a receiver operator characteristic curve. Optimal cut-off values were calculated by plotting the true-positive rate against the false-positive rate. Also, sensitivity, specificity, and Youden’s Index were calculated. Results: The cut-off points of WC, according to a maximum sum of sensitivity plus specificity for detecting at least two components of MetS were found to be 91.5 cm and 85.5 cm in men and women, respectively. 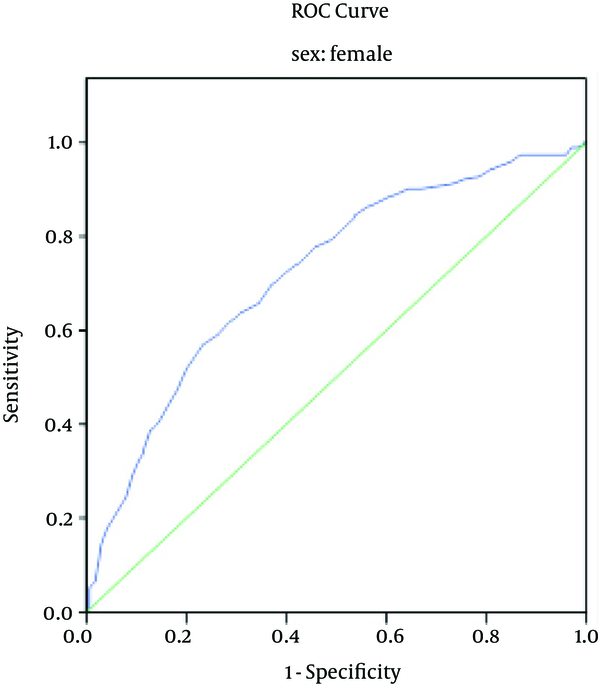 Using these values, sensitivity and specificity were 61% in men and 65% in women. The sensitivity of the male population and the specificity of the female population were found to be higher than the values proposed by IDF and ATP III. Conclusions: Optimal WC values for defining MetS were 91.5 cm and 85.5 cm in men and women, respectively. The cut-off values recommended by world organizations are not appropriate for an adult population living in Ahvaz City. Metabolic syndrome (MetS) as a global public health problem is a complex constellation of metabolic abnormalities including hypertension, elevated triglycerides, decreased high-density lipoprotein (HDL), hyperglycemia and central obesity (1). Metabolic syndrome, also known as syndrome X (2), is associated with 3 fold and 2 fold increases in type 2 diabetes mellitus and cardiovascular disease, respectively (3). Cardiovascular diseases are among the main causes of mortality in Iran (4). Several definitions, using different criteria for MetS have been proposed since 1998 (5). The first definition was released by the world health organization (WHO) based on laboratory measurement of insulin resistance and the existence of two components of the following risk factors: low-density lipoprotein (LDL) cholesterol, obesity, high blood pressure and elevated triglycerides. The third adult treatment panel (ATP III) defined the syndrome based on the presence of 3 of 5 criteria including LDL and HDL levels, fasting hyperglycemia, hypertension, hypertriglyceridemia and central obesity with an emphasis on cardiovascular hazards. Central obesity was defined as a WC of more than 102 and 88 for men and women, respectively. International diabetes federation (IDF) generated new definition and decreased cut-off values for WC to 94 and 80 for men and women, respectively (6, 7). The Iranian National Committee of Obesity (INCO) survey found that a WC cut-off point of 90 cm is a predictor of MetS in both genders (8). Central obesity, as assessed by WC, based on IDF and national cholesterol education program’s adult treatment (NCEP III) definitions, is an important component of MetS (6, 7). Determination of cut-off points for WC is accepted as the best anthropometric indicator of abdominal adiposity, which reflects increased abdominal fat or visceral fat, which has an essential role in pathogenesis of MetS (9-14). Waist circumference has been shown to be more correlated with MetS components better than fat percentage (15). So much evidence shows a link between WC and other criteria of MetS and cardiovascular disease (16). Waist circumference is a simple valid, cost effective clinical anthropometric measure predictor for detection of MetS (9-18). The use of WC is preferred to BMI for evaluation of abdominal adiposity (19), but the cut-off values of WC vary according to ethnicity, gender and lifestyle; therefore, population-specific cutoff points were incorporated into the definition (6, 20). Therefore, obtaining appropriate uniform WC cut-off value of the adult population has an essential role in diagnosis of MetS. The aim of the present study was to determine the optimal WC cut-off values in adult population living in Ahvaz city and compare the results with those of the IDF, ATP III and INCO as a predictor of MetS. This cross-sectional study was conducted by the diabetes research center of Ahvaz Junsdishapur University of Medical Sciences on 930 adults (age range, more than 20 years) referred to 6 urban health centers in Ahvaz city, capital of Khuzestan Province in southwestern Iran during 2009 - 2010. The cluster random sampling technique was used to select the samples. In the selected health center, 75 households were selected randomly. Blood pressure of participants was measured in a sitting position after 15 minutes rest by a standard sphygmomanometer. The cut-off was located on the right arm at the level of the heart of the participant. Blood pressure was measured two times with at least a 30-minute interval. Waist circumference was measured at the midpoint between the lowest rib and the upper lateral border of the right iliac crest and hip circumference at the point of maximum hip diameter. Details of other anthropometric indices measured by biochemical and clinical tests were reported elsewhere (21). A structured questionnaire was used for the collection of demographic data, anthropometric measures and risk factors of cardiovascular disease. The prevalence of MetS among participants was determined based on IDF, ATP III and INCO criteria. The optimal cut-off values of WC for detecting at least 2 components were calculated using a receiver operating characteristic (ROC) curve. ROC curves were calculated by plotting sensitivity (the true positive rate) against 1-specificity (the false-positive rate), which maximal accuracy was gained. Also, sensitivity (ability to identify true cases correctly), specificity (ability to identify true no-cases correctly) and Youden’s Index (sensitivity + specificity-1) were calculated. The Youden’s Index is the maximum difference between the ROC curve and the diagonal line. Values close to 1 indicate that the biomarker’s ability is high (22). Data were analyzed using chi-square test and Independent t-test with SPSS Inc, Chicago, IL, USA. A P < 0.05 was considered as statistically significant. A total of 930 adults (439 males and 491 females) aged over 20 years were studied. The mean age of the participant was 42.27 ± 14 years (44.2 ± 14.2 years for men and 40.5 ± 13.5 years for women). The prevalence rates of diabetes mellitus were 14.5% in men and 11.7% in women. The prevalence rates of hypertension, high triglyceride and low HDL cholesterol were 8.7%, 47.1%, and 28.3% in men while they were 2.9%, 34.1%, and 50.2% in women, respectively. The prevalence rates of MetS were 21.8% and 27.4% based on ATP III and IDF criteria, respectively. The prevalence rates of MetS were estimated to be 28.9% and 31.7% in women, but 14% and 22.6% in men based on ATP III and IDF criteria, respectively). b Data is presented as mean ± SD. 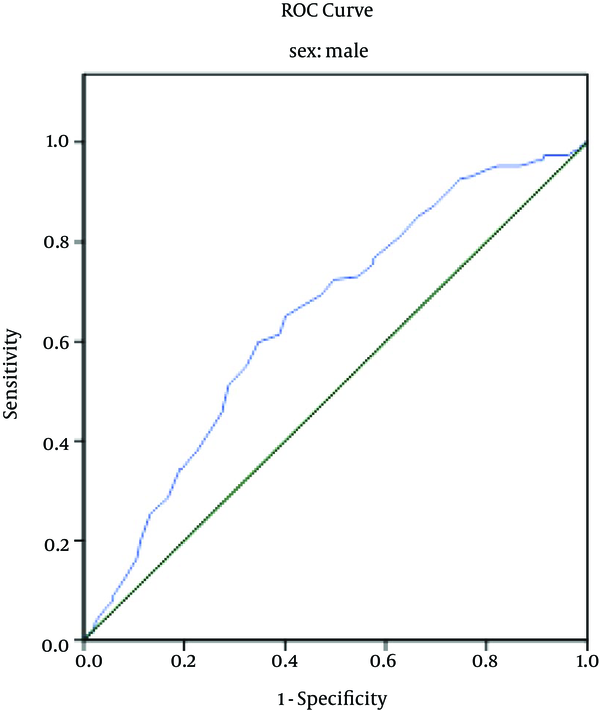 c P values were determined using an Independent t-test. The optimal cut-off point of WC for predicting MetS with at least two other components (except WC) was 91.5 cm for men and 85.5 cm for women. Table 2 shows the Area under the Curve (AUC) for WC, sensitivity, and specificity according to two international diabetes organizations, INCO and the the current study based on gender of the participants. Cut-off point of WC, sensitivity, specificity, positive likelihood ratio and prevalence of MetS, according to two international diabetes organizations, INCO and the Ahvaz study are presented in Table 3. For the male and female participants with two or more MetS components, the areas under the ROC curve were 0.72 (95% CI, 0.67 - 0.76) and 0.646 (0.59 - 0.69), respectively. The ROC curves for WC to detect the presence of at least two risk factors of the MetS in subjects of both genders are presented in Figure 1 and 2. The IDF proposed that central obesity, as assessed by WC cut-off values specific to the ethnicity and gender, is a prominent component of MetS (6). In the present study, the optimal cut-off values of WC for diagnosis of MetS were calculated to be 91.5 cm and 85.5 cm for the male and female adult population of Ahvaz city. These cut-off values are the same as those proposed by Esteghamati et al. in Tehran, capital of Iran, with higher sensitivity (77% in men and 88% in women) and lower specificity (58% in men and 50% in women) in comparison to our study (22). Kaykhaei et al. (2012) proposed cut-off point of WC to be 93.5cm for men (sensitivity = 59.27%, specificity = 78.85%) and 85.5 cm for women (sensitivity = 75.79%, specificity = 62.78%) in Zahedan, southeast of Iran (23). Sharifi et al. (2008) calculated optimal cut-off point of WC, 87 cm for males (sensitivity = 59.9%, specificity = 69.5%) and 82 cm for females (sensitivity = 68.7%, specificity = 68%) according to the Zanjan study (24). One study yielding results similar to the present study is, Lee et al. (2007) which proposed cut-off points of WC for predicting two components of MetS to be 90 cm for males and 85 cm for females suggesting them as appropriate WC cut-off points for central obesity for Korean adults (25). Moreover, WHO has defined normal WC to be 102 cm for men and 88 cm for women (26). In Iraq, the cut-off point based on the maximum sensitivity and specificity for predicting the MetS was calculated to be 97 cm for men and 99 cm for women. The sensitivity and specificity of these values were 70% and 50% in men, and 70% and 45% in women, respectively (5). Waist circumference cut-off point’s variation proposed by different studies may suggest the importance of lifestyle factors plus racial differences (19). In present study, cut-off value of WC was found to be higher in men. Similar to our findings, IDF (6), ATP III (7) and WHO (26) proposed higher WC for men. Moreover our results are in line with the Tehran study (21). Contrary to our findings, Japan (27) Oman (28) and Iraq (5) studies reported higher cut-off values for detecting MetS in females. Also, Abbaszadeh-Ahranjani et al. in a national report proposed higher cut-off points for women compared to men (29). In comparison with IDF, which proposed a WC of 94 cm for men and 80 cm for women as normal values, sensitivity was higher in men (61% versus 55%) and lower in women (65% versus 94%). Higher sensitivity in men and higher specificity in women were observed compared to ATP III definition. As can be seen in Table 3 the Youden’s index WC cut-off point value proposed by IDF for women (0.14) is very poor as is the case with ATP III’s proposed index for men (0.09). Therefore, these indices cannot be considered useful for evaluations conducted in Iran. The Youden’s indices obtained in INCO and Ahvaz study are very close (0.22 for Men, 0.34 and 0.3 for women, respectively) but the difference is that the Youden’s index in the Ahvaz study has the optimum values for both sensitivity and specificity while those of INCO study are unbalanced. Optimal WC values for detecting MetS were found to be 91.5 cm and 85.5 cm for males and females, respectively. The cut-off values recommended by world organizations are not appropriate for an adult population living in Ahvaz City. Due to the high prevalence of MetS, achieving an agreed upon definition for WC must be considered a priority. This paper is issued from the research project (D-8701). The authors would like to thanks all staff of diabetes research center of Ahvaz Jundishapur University of Medical Sciences, especially Miss Reshadatian and Dehghan, for their help in this study. Authors’ Contributions: All of authors contributed equally to this work. Funding/Support: Financial support was provided by diabetes research center, Ahvaz Jundishapur University of Medical Sciences.